Are you looking for unique gift ideas this Christmas and throughout the holiday season? Bored of the same old mundane standards? We have a list of 11 items that may make you the best gift giver ever! Gifting a skull for Christmas is perhaps not the brightest idea but you can get away with it if the skull is as attractive as this one. 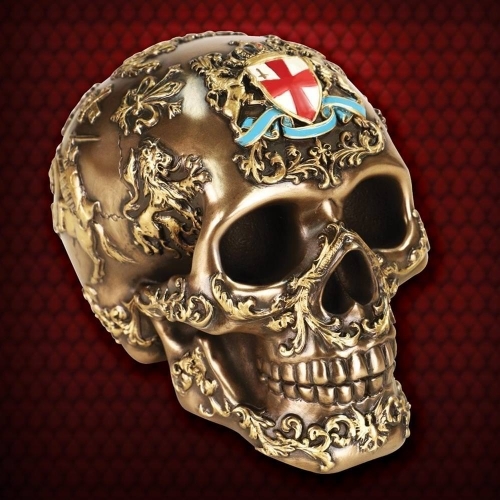 It is made of cold-cast resin, metalized in an antique bronze and features elaborate medieval heraldry. The main shield rests proudly on the forehead and exhibits a hand enameled Maltese cross. The skull measures 6-1/2" wide and 5" tall. How about something to foretell the coming year? This stunning crystal ball rests atop a beautiful resin stand. The stand which is painted to look like stone is encrusted with nine deep blue cabochons. 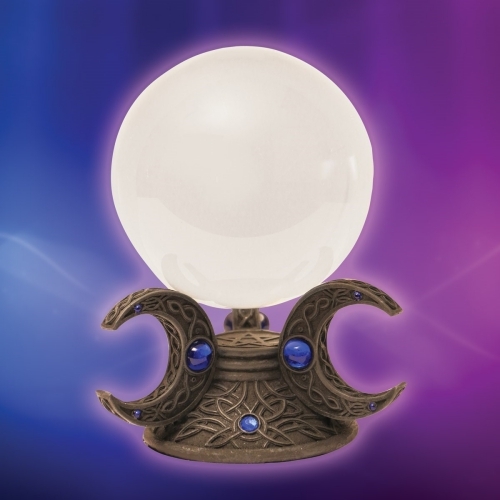 The crystal ball is 4" in diameter and the overall height with stand is 6-3/4". 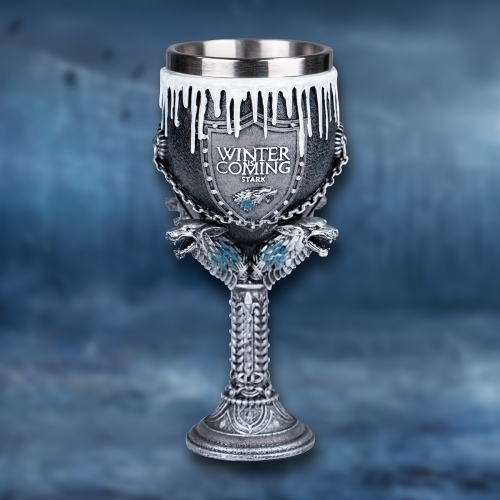 This officially licensed goblet is crafted of resin and expertly detailed by hand. It is a gift most will like and Game of Thrones fans will love. The crest exhibits the famous words "Winter is Coming" and below that is the Stark House’s sigil, a dire wolf. The goblet features four wolves emerging from the stem. It comes packaged in a pretty Seven Kingdoms gift box. The goblet is approximately 7” tall overall with a capacity of 6-3/4 oz. 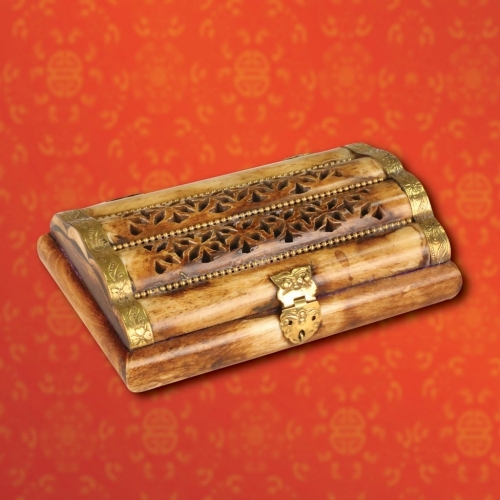 This beautiful trinket box is made of genuine natural horn. It is hand carved and features a flower motif on the lid, and the edges are trimmed in a scrolled brass. Latch and hinges are all brass. The dimensions of the box are 5-3/4" x 3-3/4" x 1-1/2". 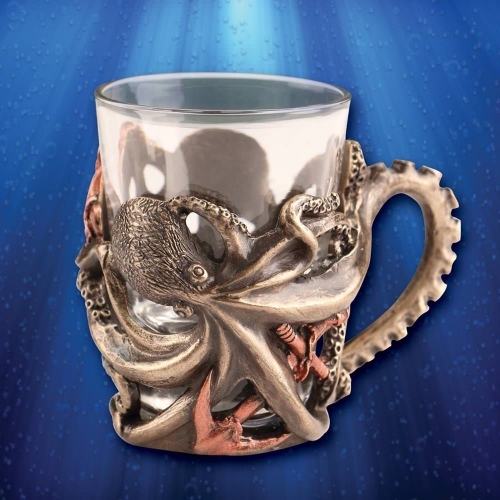 This resin and glass shot glass will ensure you have a cephalopod for the company every time you gulp one down. It’s the ideal gift for a steampunk fan. The glass is 2-3/4" tall with a capacity of1-1/2 oz. 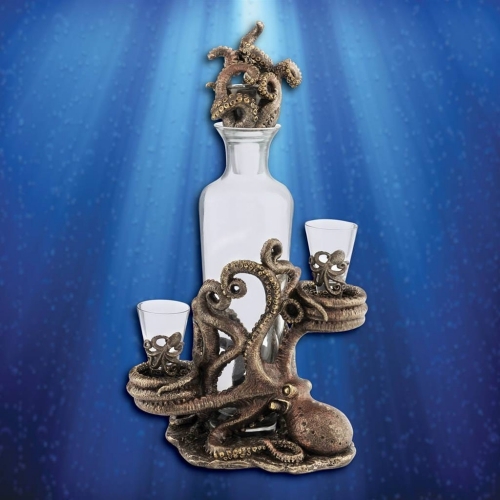 While on octopuses, check out this amazing decanter set. Metalized with an antique brown finish, this set features an elaborately detailed octopus base holding a large, removable glass decanter with a tentacle stopper. Other tentacles hold shot glasses on either side. The decanter is 15" tall overall with a capacity of 32 oz. Shot glass capacity is 1-1/2 oz each. 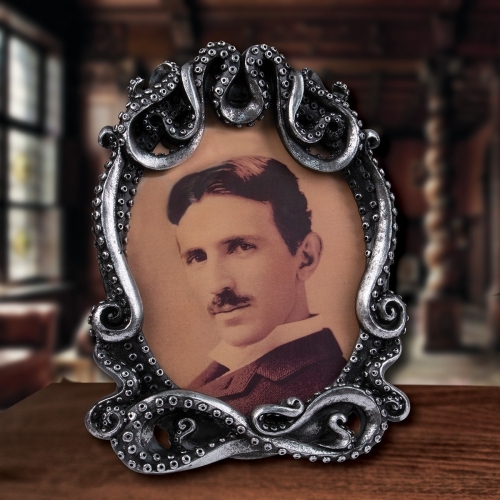 This picture frame made of resin pays homage to the biggest and worst tentacled creature of all – Kraken. It exhibits an antique silver finish and measures 9” x 7”. The frame holds up to a 6” x 8” oval photograph. 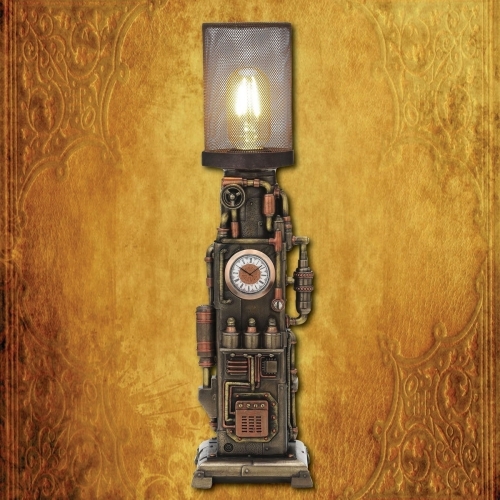 We’ll round up the steampunk theme with this stunning lamp crafted of resin and finished with the look of antique bronze. The center of this piece exhibits a clock while the top has an Edison style bulb, all within a brass mesh cylinder. This clock lamp measures 17-7/8" tall. Now here’s something for fans of the Middle Ages. 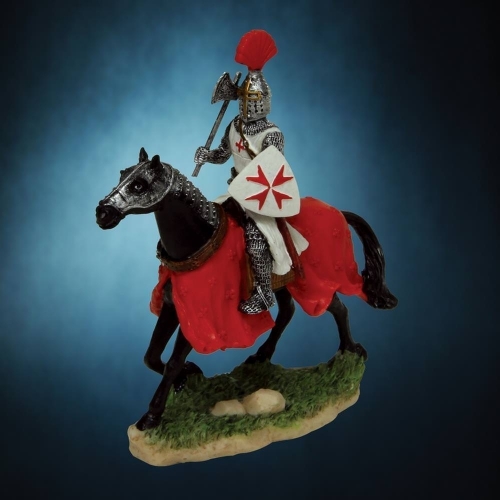 This miniature armored knight and the horse on which he rides is cast out of resin and then painted for an authentic look. Armed with an axe and shield, he looks ready for a fight. The statue measures 4-1/2" tall. 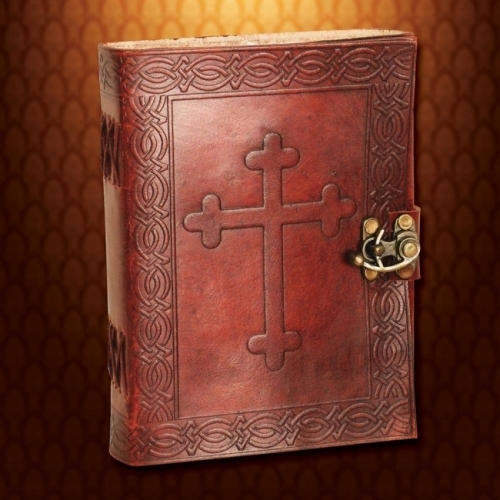 This dark brown leather journal features the Crusader cross embossed on the front and beautiful Celtic designs on the back and borders. It carries 300 pages of handmade paper to jot down your thoughts. The journal is closed with an antique brass latch. Its overall dimensions are 7-1/4" x 5-3/4" x 1-1/4”. 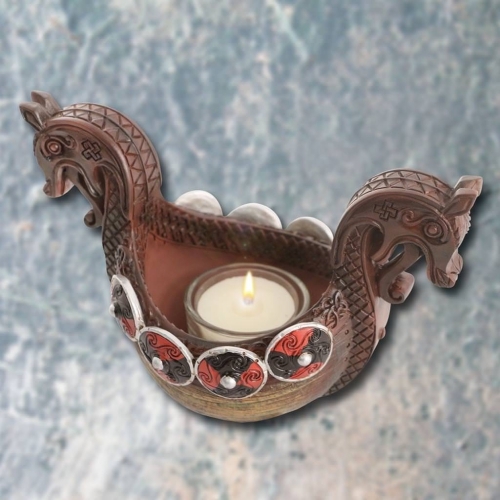 This Viking boat is crafted of resin and hand painted. It is an accent piece good enough to enhance any space. The center features a small glass bowl which can hold a regular size votive candle. The boat is 7” long and 4" wide overall. If these gifts are still not unique enough for you, here are more options.